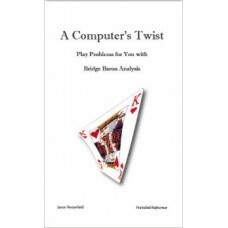 Not just your average book of bridge problems, "A Computer's Twist: Play Problems for You with Bridge Baron Analysis" provides challenging and entertaining bridge problems for you to enjoy and also includes a never before seen look inside the world of computer bridge. On each deal, after you have analyzed the deal and solved the problem, see how Bridge Baron fared on the deal and an explanation of why. "A Computer's Twist" should allow you to expand and improve your bridge game while also learning about and even competing against your favorite computer bridge program on the deals. Each deal contains a hint, to aid you in your solving of the hand, a detailed trick-by-trick analysis and solution, a post mortem discussion, and an analysis of Bridge Baron's play of the hand. The book also includes a Deal Scorecard to mark your progress and grade yourself against Bridge Baron. Deals and analysis will be made available electronically for you to experiment with on your computer as well. Concepts discussed are greatly varied and include: endplay technique, squeezes (progressive squeeze, strip squeeze, trump squeeze, one-suit squeeze), the Vienna Coup, the Scissors Coup, safety plays, restricted choice plays, dummy reversals, false cards, and much more.